A very large but shallow Reservoir containing some very big Carp. Fish to 30lb have been reported but are elusive due to night fishing not Being allowed on this water. Roach, Bream and Hybrids and some Pike are also present, The pegs at the dam end where the depth is around 6ft possibly give the best chance of success. 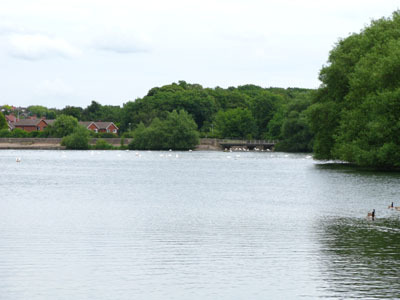 Access is available at both ends of the Reservoir with parking accessed from Kings Mill Lane at the Dam end and the public user car park accessed from the A617 road just off the A38. Follow the A60 North towards Mansfield. At the large junction just before West Notts College turn left into the A617. Continue along this road to the next set of traffic lights and continue straight on, travelling slightly down hill towards the A38 the entrance to the car park is on the right. For the Dam end continue down to the A38 and turn right at the traffic lights, at the next set of lights turn right again heading towards Mansfield. Kings Mill Lane is on the right after about 1/3 mile.